Leave with a snowmobile and discover the magic of the great white outdoors. After you spent a day in a circuit, you will leave for a real three days snowmobile raid with many photo stops and viewpoints. On your snowmobile, you will cross the “Golden Gate Bridge” and you will ride the Montagne Noire’s steep trails. You will also have an overview of the adventure thrill when you’ll discover secluded posts, far from the civilization. Crossing the Taureau lake, you will realize how huge and magnificient the surrounding nature really is. During your stay you will enjoy our nature by dog sledding. Of course, you will have the pleasure to lead your own dogteam with your guide’s advice. You will come back home with unforgettable memories of your snowmobile trip ! After breakfast, we drive to our center located in Sainte-Marguerite-du-Lac-Masson. After signing formalities, we will distribute your snowmobile equipment. Your guide will provide driving tips and rules of safety. 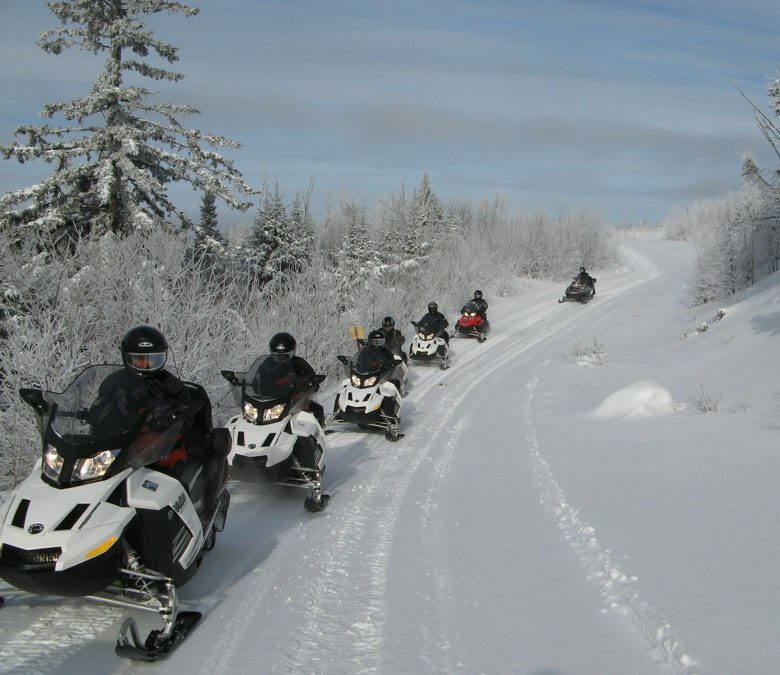 Then departure for your first day of snowmobiling on the federated tracks of Quebec. Dinner and overnight at the inn. You will leave for a three days raid. This day, you will cross the Golden Gate Bridge heading to St Côme and enjoy its ice sculptures (if the competition is on at that time of the year). Your step will lead you to the Auberge la Barrière, a rustic outfitter with all the comfort and accommodations. Dinner at the inn and overnight in a chalet by the frozen lake. This morning you will leave the Auberge la Barrière to join the Mastigouche outfitter. You will cross magnificent snowy forests and take full advantage of the Quebec landscapes that make you dream so much. Helen will warmly welcome you in its typical outfitter, away from the big touristic centers. Dinner and overnight. On the return trip, you will go on a journey towards the wild and steep landscape of the Montagne Noire. There, the trees are named “mummies” because they are wrapped in a mixture of snow and ice. You will notice many wild animal tracks. At the top of the mountain, if you are lucky, some Quebec grey jays will come to peck in your hand. Dinner and night at the inn. Take this last day to visit this beautiful city, from old Montreal to the Mont Royal plateau, and underground galleries. Don’t forget to buy maple syrup ! At the end of the afternoon, you will head to the airport to board your return flight. It is a lovely inn composed of bedrooms with double bed and private or to shared bathroom. You will relax in front of a fireplace in the living room. You can ask for Bombardier 900 ACE (90 hp) for 120€ extra in solo and 80€ in duo (per person). These prices are for double occupancy, you can have an individual bedroom for a supplement of price. Please contact us for further information.